Don't toss that leftover chicken- use it for BBQ Chicken Pizza. 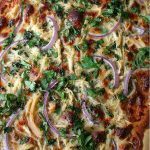 Use your favorite BBQ sauce and top with red onions and cilantro for a "fancy" pizza at home. Spread BBQ sauce over the the pizza round. Top with shredded chicken and then the cheese. Scatter red onion over the top and top with cilantro. Bake for 10-15 minutes in a 450 degree oven.